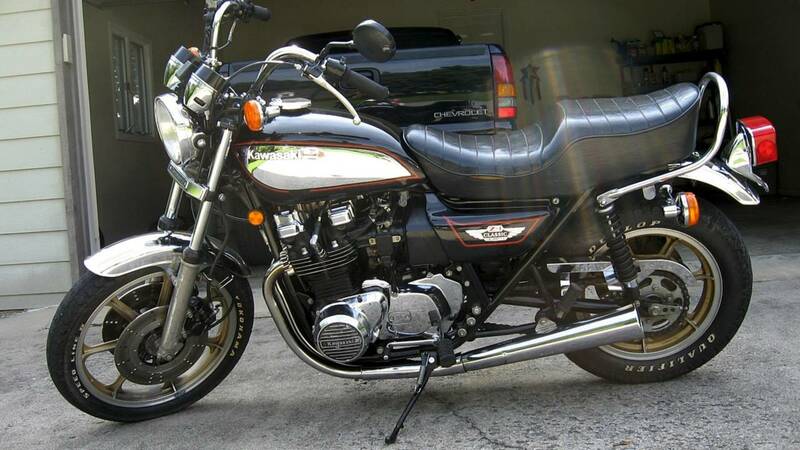 A look back at the origin of motorcycle fuel-injection on the 1980 Kawasaki Z1000 Classic. Each week RideApart looks back to highlight key milestones in motorcycle history from innovations to significant model introductions to racing successes and, of course, some of the disastrous things we’d rather forget. 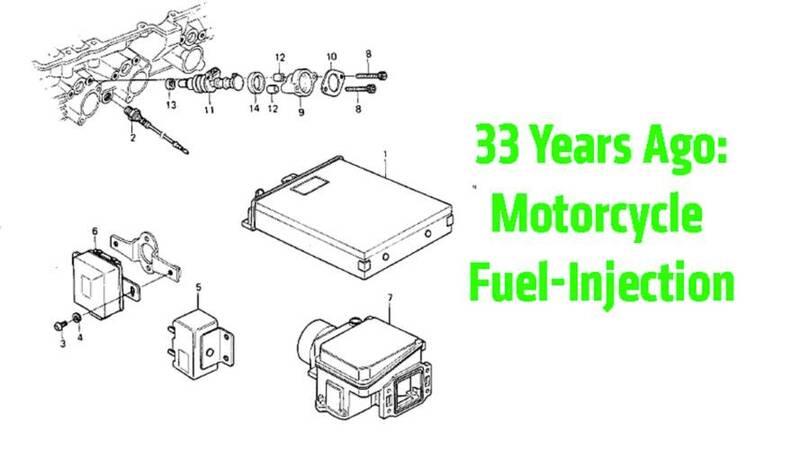 This week it’s Kawasaki's introduction of the first motorcycle fuel-injection system. In the late 1970’s Kawasaki Z1000G-1 Classic was a popular heavy cruiser, weighing in at 555 lbs, with a claimed top speed of 127 mph, and 93 hp at 8,000 rpm from its four-stroke, transverse four-cylinder engine. But the Kawasaki engineers had also done something to it that was regarded by customers and the media alike as really rather odd. For the 1980 model year the Z1000 Classic was equipped with an electronic fuel-injection system (pictured above) pushing its retail price up to $4199, which was $500 more than the standard carbureted Z1000 LTD version. That was a whopping price difference back then even though the Z1000 Classic’s fuel-injection system was presented as the very latest engineering technology available on a motorcycle. You even got a computer of sorts stashed under the seat and the chance to ditch an engine’s choke for cold starts once and for all. The specialist motorcycle media at the time was immediately skeptical about this new development with one publication even stating that fuel-injection on a motorcycle was “the death knell for home maintenance and road side repairs”. The journalists were also somewhat baffled by the Z1000’s onboard computer, which regulated the fuel-injection, describing how it worked as staggeringly complex. The fuel-injection system on the Z1000 Classic weighed 16.7 lbs rather than the 15.7 lbs of a conventional carburetor assembly on the Z1000 LTD. It was manufactured for Kawasaki by Japan Precision Electronics, which had the rights to produce the Bosch Jetronic system specifically for motorcycles. In actual fact it was identical in concept and design to Bosch fuel-injection that was being used on Datsun (Nissan) cars at the time. How that early system on the Z1000 worked was to monitor via a series of sensors, ambient air temperature, engine temperature at the cylinder head, airflow into the airbox, engine revs, throttle position and intake manifold vacuum. "Considered in terms of function alone setting aside the real-world factors of cost and ease of maintenance or repair, the Kawasaki fuel-injection system works flawlessly. "Let the engine idle down to 1000 rpm in fifth gear, then grab a handful of throttle. Instead of a gasp and a dead engine, the rider gets a smooth, steady acceleration without a shudder of complaint. The engine can’t be killed with the twist grip, can’t be handled so clumsily that it won’t run any way but smoothly and steadily." The really curious thing in all of this was at the launch of the EFI Z1000, Kawasaki remained remarkably coy about why it had launched fuel-injection on a motorcycle in the first place. Its fastest bike in 1980, the KZ1000 MkII, was equipped with carburetors and cost $750 less than the newly fuel-injected cruiser Z1000. The truth of the matter lay with the Environmental Protection Agency here in the U.S., which was starting to tighten emission regulations on all road vehicles. In 1980, Kawasaki was the first motorcycle manufacturer to recognize that in the following years, bikes would have to meet even tougher compliance laws. Fuel-injection, rather than carburetion, on an engine would be one way to get a motorcycle through emission testing. So it was a 1980’s Kawasaki heavy weight cruiser that was the start of what we have all come to accept as entirely normal on today’s motorcycles – fuel-injected engines. We’ve never ridden a Z1000 but we have heard that in later years they are really difficult to work on, have a tendency to be unreliable and parts for the fuel injection system are nearly impossible to find. If you own one, or have owned one, what’s been your experience?